Who doesn’t want to save money while shopping? From the casual coupon clipper to the extreme couponing extraordinaire, the goal is to save money. Fortunately, there are plenty of bloggers dedicated to helping you do just that. I truly didn’t comprehend how many couponing blogs there are until I decided to write this article. I follow one coupon blogger and I still don’t always use coupons when shopping. I might start after today. Kristy covers it all from how to become a couponista and frugal tips to first looks from companies and product reviews. There is something for everyone and every level of couponing. I especially enjoyed Kristy’s frugal tips. I keep saying that I am going to quit buying laundry soap and make my own, and Kristy shares how to do it. I’m also not the most organized when it comes to household chores but the Couponista is and shares her chore chart. Follow Adventures of a Couponista on Facebook. Couponing 101 was created by Stephanie, a homeschooling mom from Texas, to motivate other moms and help them creatively stretch budgets. 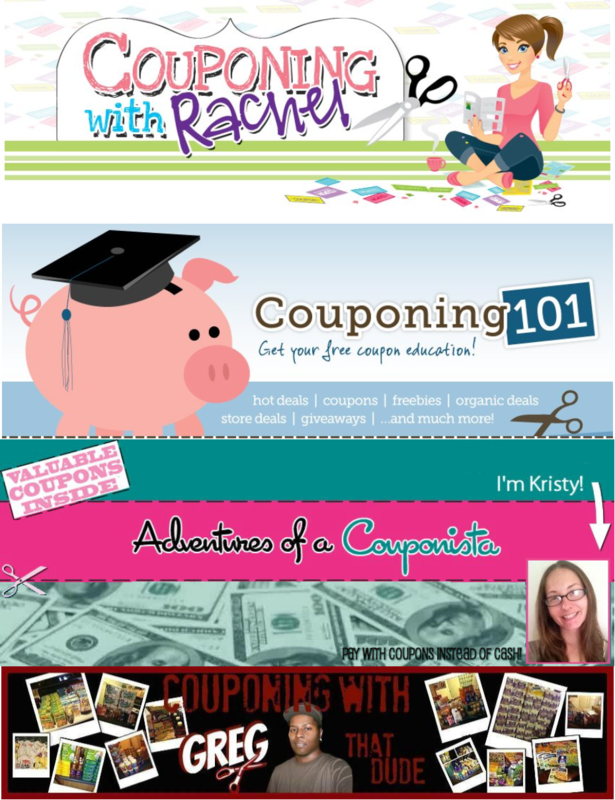 Despite the title, Couponing 101 is not just about coupons. It also offers a wide range of money-saving strategies. Stephanie offers advice like 50 Outdoor Kids Activities for Spring and recipes for freezer cooking, plus she shares what you can get free in stores with coupons. Speaking of free, Couponing 101 has a Freebie Friday series! Follow Couponing 101 on Facebook. Rachel’s posts about coupon deals are detailed and easy to follow, even for an amateur like me. I’m partial to her restaurant coupon finds and Kindle freebies but she covers all manner of coupon deals. If you want to really get the down low on couponing she hosts blogging classes throughout Northeast Ohio. If you aren’t in Ohio, you can check out how to get started with coupon organization. Follow Couponing with Rachel on Facebook. Couponing is not just for women, as Extreme Couponing with Greg that Dude proves. According to his site, he is “just a guy whose goal is to help as many people as I can save a lot of money” while showing that guys can coupon, too. In addition to covering the basics of couponing through a vlogging series and sharing daily coupon deals, he includes photos from his own shopping trips. As an occasional coupon user, I can appreciate how he breaks down the process of using coupons in store scenarios and matchups. Follow Extreme Couponing with Greg that Dude on Facebook. P.S. Ever wonder how we come up with ideas for our blog profiles? Our handy list of industries and subjects on PR Newswire for Journalists stays top of mind. If you’re a blogger or journalist looking for consumer product and retail news, let us know. We’re happy to customize any of those feeds for you on PR Newswire for Journalists. Been following some of these bloggers for awhile now. Good List!